Fashion inspiration for all lovers of the true crime genre. This week, I’m heading into darker territory (yes, darker than the Heart of Darkness) while also transitioning to nonfiction with the groundbreaking new genre of true crime that blossomed in the 20th century. Please note: These outfits are NOT meant to draw inspiration from acts of murder – on the contrary, the looks are inspired by the detective work, journalist effort, and media reaction that developed in the aftermath of the crime. In Cold Blood was published in 1966 by American author Truman Capote, who was perhaps best known at the time for his bestselling work of fiction, Breakfast at Tiffany’s (which was adapted into an award-winning film starring Audrey Hepburn in 1961). If it seems like a huge shift in genre, that’s because it was, but Capote’s skill as a fiction writer gave In Cold Blood the tense, chilling narrative edge it needed to really launch the genre to a wide, general audience. Appealing to nonfiction and fiction lovers alike, the book was an immediate success and cemented Capote as a writer of great dedication, skill, and versatility. Interestingly enough, author Harper Lee assisted Capote in the hands-on research of the Clutter family murder, and was already a respected author in her own right for To Kill a Mockingbird. Capote spent several years researching the events of this book, and managed to capture miniscule details, from the buried childhood of the two criminals – Richard Hickock and Perry Smith – to their long-awaited execution by hanging. His attention to detail enables the reader to be fully immersed in the tension, fear, and anxiety surrounding the murders, and Capote went to such lengths as interviewing the two men in prison daily before their execution. Of course, this story (like many others) could have been written in a clinical, detached manner that focused only on key facts and data, but Capote fleshes out so many of the characters involved that it’s nearly impossible to ignore the human error that led to one of the greatest tragedies – and mysteries – of mid-century America. I’m doing things differently with In Cold Blood. Instead of taking quotes from the book, I’m basing the outfit sets around the public’s point of view. The murders of the Clutter family generated one of the greatest media storms and publicity that an America crime had ever seen, and it seems appropriate to use that as a source of inspiration. 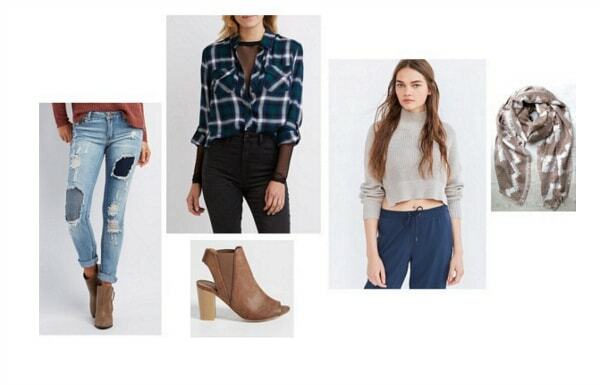 In addition, since the primary setting is November and December in Kansas and we’re all settling into fall, these outfits are going to be cold-weather oriented, and incorporate layers in the same way that this book juggles multiple focal points and timelines. This first outfit represents the life of the Clutters before the shock and spectacle created by the news that a small-town family from Kansas, well-regarded and respected, was senselessly slaughtered in their home. The outfit consists of layers and a combination of textures because the characterization of the family is where Capote truly shines, as he fleshes out the entire family of victims, as well as their friends and acquaintances. He draws intense sympathy by portraying the Clutter family as everyday Americans and not as distant murder victims in the way that many previous crime writers had done. The basic shape and structure of this outfit is casual and relaxed in order to illustrate the farm-inspired lifestyle of the family, and is an idealistic nod to the life they could have continued to have – quiet, full of integrity and depth, and peaceful. The patchwork jeans, blue plaid, and gray sweater combine comfort with personal style, and also illustrate the classic image of the All-American family. Warm brown accessories recall farm life, as leather is prized for its longevity and quality, as well as its timeless style. The uneasiness and confusion that saturated the media aftermath during the period of agonizing weeks when investigators lacked any real suspects was terrifying because many were certain it would become one of countless unsolved murder cases. While Hickock and Smith were on the run, the trail became colder back in Kansas. One of the reasons In Cold Blood became so successful is because of the level of detail and precision provided by Capote through the cooperation of investigators and Smith and Hickock themselves. The Clutter family case became one of the few mysteries that could be almost completely uncovered, which is an absolute rarity in these cases of randomly-committed crimes. This outfit captures the uncertainty preceding the unexpected breakthroughs in the case, with stark color contrasts that are almost dissonant in the way that they come together. 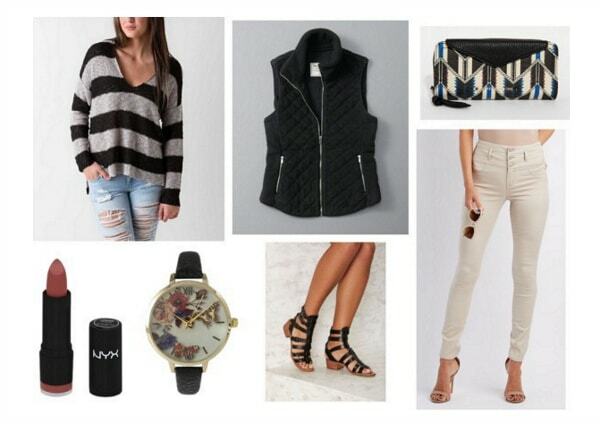 It breaks all the rules – mixed patterns, black and navy, etc. – but still retains a poised look that resembles the way that Americans were able to keep their heads held high in solidarity. The pants, vest, and watch also hint at a uniform, which is a reference to the police and other people in uniform that were so supportive and integral to the detective process. The impact of the publication of the book was immediate and powerful. It covered the entire timeline of the murders, but also delved into the history, personalities, and motives of so many other figures that were involved. 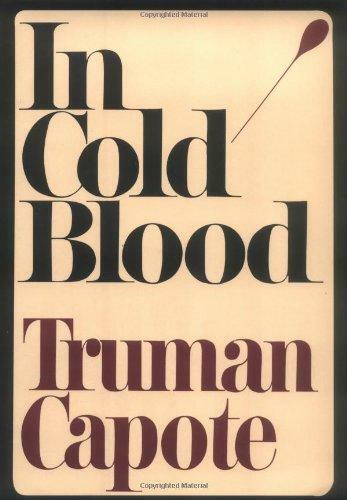 The scale of dedication and research that went into the creation of In Cold Blood resulted in one of the first (if not the first) non-fiction novels for the life Capote breathed into the overview of the crime. This outfit takes its inspiration from the visual mark the book left on audiences with the iconic book cover. The black and dark red color scheme is striking in its simplicity, because it is dramatic without needing any frills or embellishment. It draws attention to the unique typography and lettering, and adds a sense of intrigue and mystery because it does not use explicit images to anticipate the actual story. The entire look is minimalistic and dark, without giving too much away. There is not much skin on display; instead there are peek-a-boo details, such as the socks. A modern-day girl who exemplifies this genre, in my opinion, would accessorize by carrying around books by amazing authors like Gillian Flynn that are thrilling, substantial, and full of crime, and her mirror, which literally polishes off the overall look. Have you ever read a true crime novel, or any nonfiction novel? Are you a fan of Truman Capote? Let us know in the comments below!